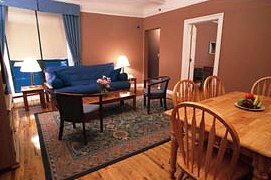 Budget to Luxury Fully Furnished Manhattan Apartments No Minimum Stay It's a home away from home for visitors to New York City, and an excellent hotel alternative. Book our comfortable furnished apartments on a nightly, weekly or monthly basis. Guests need only bring their suitcase to Metro-Home's spacious fully furnished apartments. All the creature comforts are provided, including a fully stocked kitchen, linens and towels, cable tv, telephone with dataport for internet access and answer machine, laundry facilities and more. The Hospitality House is located on East 49th Street between Lexington and Third Avenue. 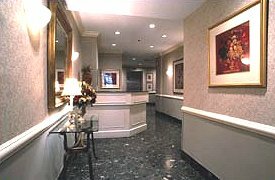 This newly renovated elevator building in the heart of New York City's midtown hotel district has fully-furnished apartment suites, with queen size beds, convertible sofas, and fully equipped kitchens with microwave and dishwasher. The Hospitality House also features a 24-hour concierge desk. For more information, rates, and reservations, please contact Metro-Home, Manhattan's leading provider of fully-furnished short term apartment rentals and long-term apartments. This and other Short Term Rental Apartments can be found here in The Register.